They have nothing, they carry with them what they own, in many cases they don't have a backpack or even shoes. Sometimes they have a blanket, sometimes they only have a plastic bottle, but whether it is in the searing heat of summer or the frost of winter, they are always there, just walking. Now as most of you will know, the N1 between Beaufort West and Laingsburg is pretty dire. Driving there is my "thinking time". I love to dream up stories/scenarios, and every time I drive past these guys, my mind runs away with me. Who are they, where are they from, where are they going, are they running away from something, do they have nothing left to live for? Imagine you are walking to Cape Town. I always imagine...what happens when these guys reach the outskirts of Cape Town? I mean, what do they do, who do they speak to? They have no cell phone, no money, no food, no water........ I have always been fascinated by them. We organise trail runs because we love nature and being outside, it is our passion, and we want to share with people what we love so much. For me, that does not stop at trail running. We want to share these stories in the hopes that other people can also understand more about these Wonder Walkers. We cannot change where these people come from, or where they are going, but we can help them along the way. We decided that we want to help these guys along the road, and maybe try and document their stories. And so, Wonder Walkers was born. Our long term goal is to carry stocked backpacks in our cars, and give them out as we see people who need them. For now we are starting with the most amazing sleeping bags from Street Sleeper, especially designed for use by homeless people. Ultimately, we would like to provide a fully stocked backpack with sleeping bag, headlight, reflective vest, hat/beanie, food, jacket, shoes, etc. ​Seeing the emotion when these guys receive a "care package" is something indescribable. They walk along the road, clearly not even trying to get anything from anybody, just focusing on surviving, and here, out of the blue, someone stops and gives them something that will help them immensely along their journey. There is joy, appreciation and disbelief all in one facial expression. 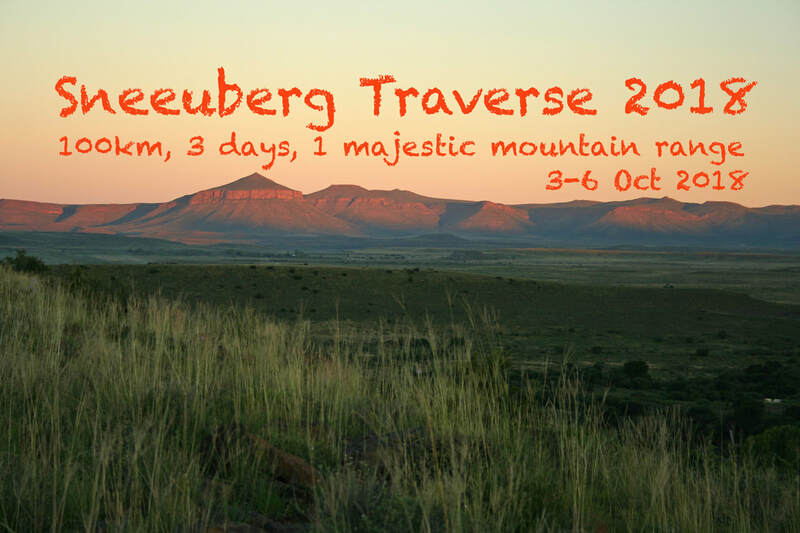 We feel that that type of caring is in the spirit of Karoo Running. So if you would like to get involved in any way, please get in contact with us. You can sponsor a care package, or a sleeping bag, or even if you have old running shoes, backpacks or old clothing lying around, we can use it to help a Wonder Walker, so please let us know. ​​William Ngomeni I met just outside Three Sisters on 02 Nov 2018. He was not sure about his age, but guessed he is around 31 years old. We had a nice long chat and he told me is from Bizana in the Eastern Cape. He was headed to Johannesburg in search of a better life and work. He was very happy to receive a large food parcel, personal hygiene products, some water and a sleeping bag from Street Sleeper. 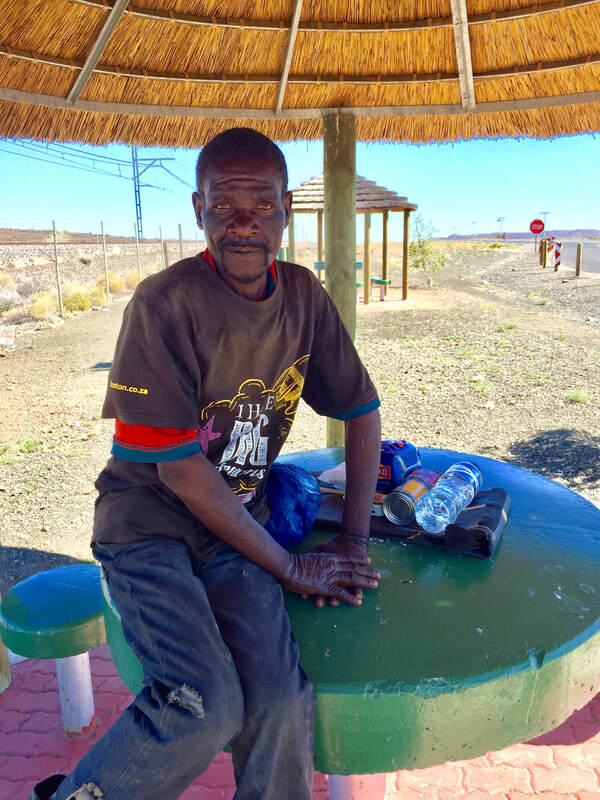 On 25 August I met Richmond Richard Siana (50) just outside Beaufort West. 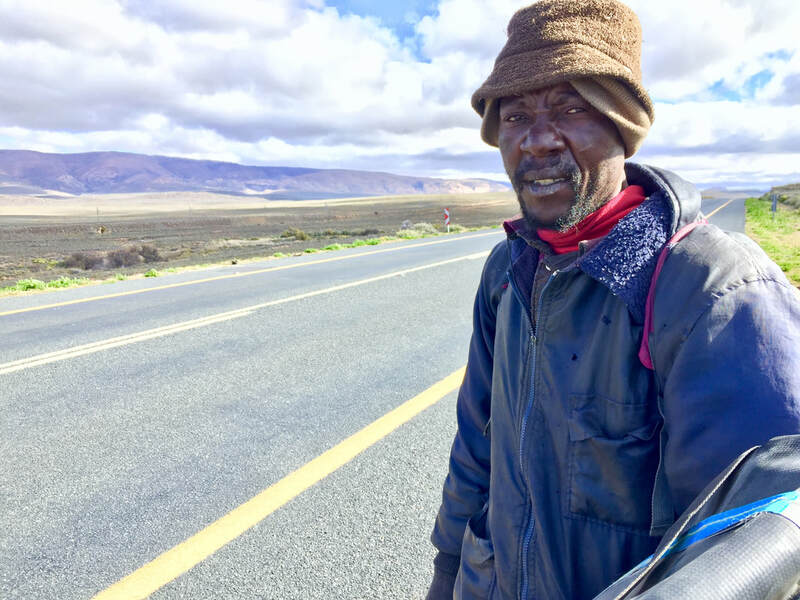 ​He has been walking for one month, and was on his way to Cape Town looking for work. We tried to talk to him, but communication was really difficult, as he did not really speak Afrikaans, English or Zulu. ​On the same day I came across Jean Mahapa, walking from Mpumalanga to Beaufort West, in search of work. Both of them received a "care package" with food, personal hygiene products and some "treats", along with the Street Sleeper sleeping bag. On my way back from Cape Town, I first came across Willem Adams, just past Prins Albert road, where he was on his way to look for work at some of the farms in the area. It was very cold and we supplied him with a sleeping bag. ​Shortly after, just before Beaufort West, I met Zukile Myengene. He was hoping to reach East London, but was walking in the wrong direction. I managed to provide him with some well needed shoes, as his were finished/non existent, a carry bag, food, water and a sleeping bag. We also tried to point him in the right direction, but he had a very difficult time understanding what I was trying to say, and I could not really understand him. ​Jackson Kwenana is 47 years old. When I met him just past before Three Sisters he was already walking for 2 weeks from Cape Town en route to Bloemfontein. He left Bloemfontein for Cape Town in the hope of finding work but was unsuccessful and is returning home. We were able to provide Jackson with a sturdy carry bag and a survival bag from Street Sleeper. We were also able to provide him with socks, toiletries and food in the back die to the generous donations we have received. Jackosn was extremely appreciative and would like to thank everybody that had a hand in helping him. Salani Pein is 38. 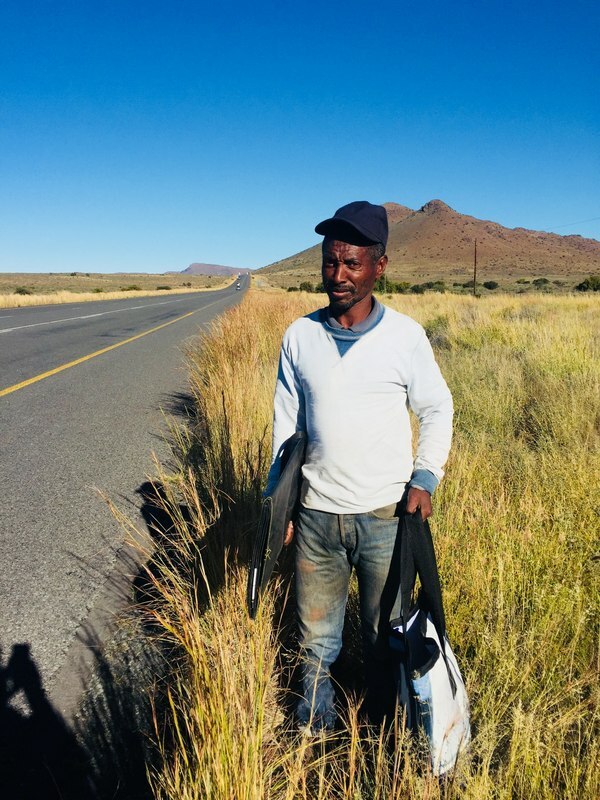 He is from Zimbabwe and was walking from Cape Town to Beaufort West in the hope of getting some work as he heard from a friend their MIGHT be work a available there. Meet Razeak Mark, 38, from Limbe, Malawi. He left Blantyre on 17 Feb 2018, traveled by bus to Harare where he was robbed at the bus terminal there, loosing his money and bag with belongings but keeping his passport, luckily. From Harare he walked to Kundu district close to Beit Bridge, eventually getting a lift to Beit Bridge, where he was stamped into South Africa. There someone good samaritan gave him R100, which he use to take a ride to Johannesburg. He stayed in Johannesburg for 1 month, but after not finding any work, he decided to walk down to Cape Town to see if he has better luck there. I met him 50km before Laingsburg, on the Beaufort West side. He has been walking for 17 days from Johannesburg to Cape Town. On 7 Feb I managed to assist 3 more Wonder Walkers. For the first time I cam across a woman, Margaret Siasia, from Lilongwe, Malawi. She has been walking for 1 year, 1 month, 3 weeks and 1 day! ​I am quite sad/emotional, I managed to chat with 3 of the 4 #WonderWalkers I came across today, 15 Jan 2018. However, the one guy was so scared and traumatized, he refused to stop or to take anything from me. In the end I drove ahead of him, put the sleeping bag and some food down and drove away some distance. I saw him picking it up, so I know he got it. It was quite a reality check coming back from a happy family holiday, filled with love, to have to imagine what horrors this poor man must have endured to be so scared of another human being that he would not even accept help if it is given to him, it breaks my heart! ​We came across Zollie Zita on 4 December 2017, just outside Laingsburg. His story is a familiar one, he left his home town, and community, of Hanover in the Northern Cape, to go and see if he can make it big in Cape Town, like so many others do. After some time and hardship in Cape Town, he came to realize that his home and being surrounded by community, was not so bad, and decided to head back to Hanover. Cape Town was hard on him, and he did not have anything except the clothes on his back as he headed back home. We handed him a Street Sleeper sleeping bag, as well as some food and water to help him along the way. ​On 24 November 2017, Black Friday, as hordes of people descended onto shopping malls all over the country, much like the grass hopper plauge of ancient Egypt, I was on my way home. Just after Laingburg I came across Isaac Mutia. Isaac is on his way From Cape Town to Meru, Kenya. He had tried making it in Cape Town but has decided that his home is better than Cape Town! He estimated that it would take him about 5 months!!! ​​About 50 km further I came across Charles Magwebu. Charles left Cape Town last Thursday, and after a week was only halfway between Laingsburg and Beaufort-West. He is on his way to his family in De Aar, where is planning to stay, as life in Cape Town was just too hard. On Monday, 3 July 2017, we came across Andries, on the N1 between Beaufort West and Laingsburg. It broke my heart, as there was no way we could communicate with Andries, other than him telling us his name. He was not able to understand English or Afrikaans, or any other efforts we made to try and speak another language. It was quite a shock to realise this man is walking (clearly to Cape Town) without being able to communicate or understand most of the people he meets along the way. We provided Andries with a Street Sleeper sleeping bag and some food and water. His happiness and gratitude did not need language to convey itself! ​Cheata Tots , walking from East London to Cape Town in search of family. We provided him with a Street Sleeper sleeping bag on 16 May. ​Skumbozo Kosi, our second #WonderWalker for May. 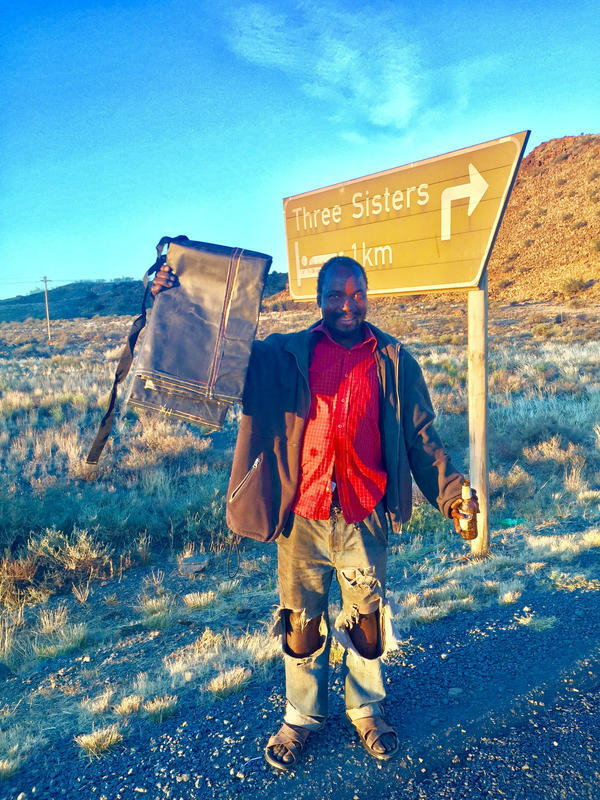 We found Skumbozo on the stretch of the N1commonly referred to the "Road of Death", between Beaufort West and Laingsburg. With the cold winter nights in the Karoo setting in, and frost every morning, he was very happy to receive a Street Sleeper sleeping bag and some food rations. 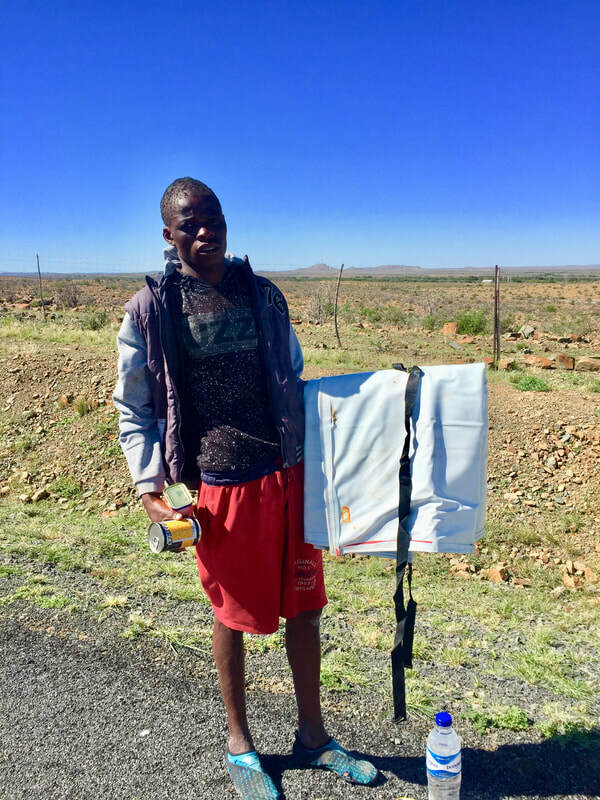 He is busy walking from Kimberley to Cape Town in the hopes of finding a job in Cape Town! At the time of meeting him he was not even sure how long he has been walking!